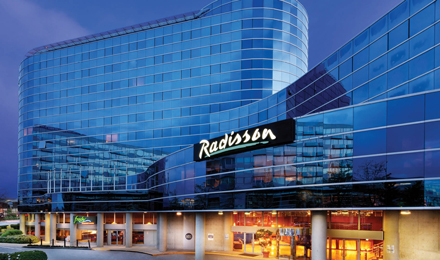 Whether you're in Delhi for vacation or business meetings, you'll love the prime location of the Radisson Blu Plaza Delhi hotel, situated in the NCR and just moments from Indira Gandhi International Airport and Gurgaon's business hub. Rest well in 261 modern hotel rooms and suites with amenities like free wireless Internet and 24-hour room service. Feast on unlimited kababs at The Great Kabab Factory and sample international cuisine at NYC. You can keep up with your workout routine in the state-of-the-art gym, and melt away the stress of the business day in the luxurious on-site spa. Host busines meetings in Delh NCR for up to 1,000 people in the 7,260-square-foot meeting space. Rest well in 261 guest rooms, including 140 Superior Rooms, 64 Premium Rooms, 35 Business Class Rooms, 21 Suites and a Presidential Suite. After a long day of exploring ancient attractions and shopping in expansive malls, come back to your comfortable accommodation in Delhi and enjoy a comfortable bed, well-stocked mini bar and complimentary Wi-Fi. Guests also enjoy silk designer upholstery and linens, plush beds, rain showers and mist-free mirrors. While staying at the Radisson Blu Plaza Delhi, be sure to dine at one of the five on-site restaurants and bars. Offering excellent hotel dining, these restaurants in Delhi serve exceptional Western, Italian and Spanish cuisine, as well as traditional Indian specialties. Enjoy unlimited kababs at The Great Kabab Factory, world cuisine at NYC, afternoon tea at R-The Lounge and fine wines at Savannah Bar. If you would like to spend the evening in your hotel room, make a selection from the convenient room service menu.